All of us live in a watershed! A watershed is any area (both above ground and below) that drains to a particular area—such as the Connecticut River. The Connecticut River watershed is more than 11,000 square miles and includes portions of four states: NH, VT, MA & CT.
Everything we do in our watershed affects the health of our local water bodies! Here are some things you can do to help keep our rivers clean and healthy. Seventy percent of the water we use every day is used inside our homes! The good news is there are many things you can do to conserve and protect water in your home. 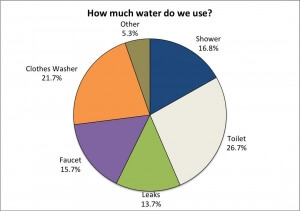 Figure adapted from American Water Works Association Research Foundation. “Residential End Uses of Water.” 1999. Do only full loads of dishes and clothes or use lower water settings for small loads. Use cold water when possible to save energy and money. Install low-flow showerheads and low-water toilets. Look for the WaterSense label! To learn about rebate programs that may be available in your area, check out the US EPA rebate finder. Check for leaks. In the US, leaks waste 1 trillion gallons of water each year. If you don’t know how to check for leaks, you can find suggestions on the US EPA website. CFLs, LEDs, and Energy Star appliances use less electricity than regular lightbulbs. Water may be used to generate electricity and can get polluted in the process, which negatively impacts the habitats of fish and other animals. Pack a reusable water bottle. Each year, thousands of plastic water bottles end up in our rivers. This trash is ugly and can harm fish and animals in our rivers and oceans. Over half the water we use outdoors gets used for landscaping and lawn care. Sadly, much of this water is wasted due to evaporation and runoff. Even worse, water runoff from yards (from rain or excess watering) can carry lawn fertilizers and pesticides into our rivers. Use native plants in you garden or home landscaping. Native plants are adapted to the climate here in New England and typically require less water once established. They also attract native birds and insects! Reduce your lawn size. Lawns typically need more water than many native trees, shrubs, and groundcovers. Limiting lawn to places where it serves a specific function can reduce the need for fertilizers and chemicals, which can pollute rivers through runoff. Capture rainwater by installing a rain garden or rain barrel near your home. Rain gardens absorb water before it has a chance to enter a storm drain and head to our rivers. Rain barrels store rain water for use during dry weather. Water slowly & set a timer. Allowing water to penetrate gradually helps plants establish healthy root systems. Once you know how much water your plants need, a timer can help you make sure you do not over water and reduce runoff from entering rivers. Use mulch in the garden and around shrubs to help reduce evaporation. You can even use grass clippings from mowing the lawn as mulch. Mulch also reduces weed growth—limiting need for fertilizers or chemicals. Pick-up waste. Any waste, even dog poop, can eventually reach the river. Wash your car on the lawn instead of the driveway. Soapy water flowing directly into our rivers, or even into a storm drain, can pollute our rivers. National Park Service WebRangers – You test the water. Is it clean? National Park Service WebRangers – Be the fish – get home safely. National Park Service WebRangers – Is it trash or recyclable?